“Enoshima has the myth of a five-headed dragon. The dragon was responsible for the hardships in the surrounding area, and the benevolent goddess Benzaiten eventually came from above to soothe the dragon’s rage. Along with her coming, she raised a large landmass from the ocean to serve as her dwelling. The dragon, wooed by Benzaiten’s beauty and benevolence, fell in love with her, but she rejected his proposal as punishment for the adversity he had brought to the humble fishing communities. The dragon, in repentance, then became a dormant part of Enoshima island where it still remains today (an area called “Dragon Hill” on Enoshima.) The Enoshima land of Goddess has a Enoshima shrine, which is famous for a god of match-making”. 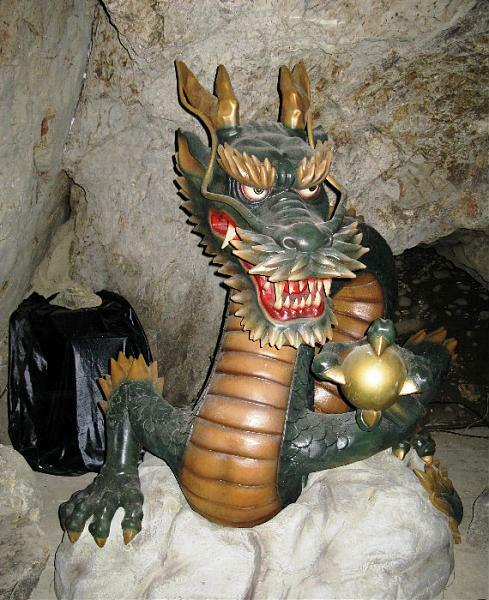 The second (east) cave, which is linked to the first one (dedicated to the Benzaiten goddess) is dedicated to the dragon deity that has long been believed to be the guardian deity for fishermen. In the far end is the statue of a fierce-looking dragon, colored green. From time to time, the artificial sound of thunder surprises visitors. Legend asserts that this dragon (some say it was a large serpent as long as 60 meters residing in the cave) deity came into view when Tokimasa Hojo (1138-1215), father-in-law of Yoritomo and the First Hojo Regent, visited here and prayed for the prosperity of his offspring. The dragon promised that Tokimasa’s wishes be answered, leaving behind three scales, which are the origin of the Hojo crest, or Three Scales. Enoshima is the name of an islet, 4 kilometers in circumference, linked to the mainland shore of Fujisawa city by two 600-meter bridges. Three shrines stand on this islet, each sacred to a mythological goddess. Legend asserts that 29th Emperor Kinmei (510-571) built a small shrine inside the cave in the southern bluff, wherein enshrined were trio goddesses. They were Tagitsuhime, Ichikishimahime and Tagirihime, all of which appear in the Ancient Chronicle, or Kojiki. (the trio’s names are slightly different from those in the Chronicles of Japan or, Nihon Shoki). The mother shrine for the trio is in Fukuoka Prefecture and called Munakata Shrine. Hence the name of Munakata Trio Goddesses. Japanese Buddhism, in the meantime, was first introduced in the 6th century from China by way of Korea when Emperor Kinmei was in power, and later, the cave here became the favorite spot for Buddhist priests to practice asceticism. Among them were Priest Kukai (774-835), the founder of the Shingon Sect, Priest En-nin, the third chief priest of Enryakuji near Kyoto (mecca of the Tendai Sect), Priest Nichiren (1222-1282), the founder of the Nichiren Sect, and Priest Ippen (1239-1289), the founder of Ji Sect. A harmonious fusion of Shinto and Buddhism was already in progress in the eighth century. As the cave was often awash by waves, enshrining the goddesses in a safer site was long thought necessary. In 853, Priest En-nin, commonly known by his religious name Jikaku Daishi, erected a shrine atop the islet, which is the origin of today’s Nakatsu-no-miya, one of the trio shrines. Enshrined at the Okutsu-no-miya shrine is Tagirihime. 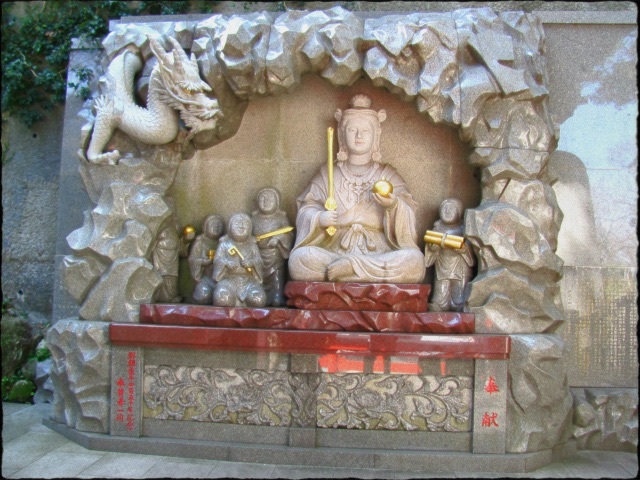 In the tradition of one of the many appearing and disappearing deities of Japan(reminiscent of Hittite weather and seasonal solstice deities), legend holds that the goddess usually stays in the cave down the cliff during winter coming up here on the first Serpent Day of April and going back to the cave on the first Boar Day of October on lunar calendar. The shrine is a typical irimoya (hipped-gabled roof) style of architecture, though not old. It was rebuilt in 1842. On the ceiling of the oratory, the well-known ‘A Turtle Glaring at Eight Directions’, painted by Hogetsu Sakai (1761-1829). On the south side bluff of Enoshima, there are two caves. It was Yoritomo Minamoto (1147-1199), the founder of the Kamakura Shogunate, who invited the Benten (also referred to as Benzaiten. Sarasvati in Sanskrit) goddess here for the first time, and named it Kinki-zan Yoganji, a Shingon sect Buddhist temple, since the Benten was apparently of Buddhist element. It was founded as a sub-temple of Nin-nah-ji in Kyoto. To the newly enshrined Benten, he prayed for victory over the Fujiwara Clan, that was then powerful and grew near to rivalling the Minamoto up in Hiraizumi, Iwate Prefecture in the northern part of Honshu. Originating in Veda of Hinduism, Benten* is known as the goddess of fortune and closely associated with water or snake. (For further details, see Zeniarai Benten). * She is one of the Three Great Bentens in Japan including the one here at Enoshima. The others are Miyajima (Itsukushima) Shrine in Hiroshima and Chikubushima Shrine in Lake Biwa, Shiga Prefecture, all located near water and venerated basically as the guardian deity of voyage. “The water goddess Benzaiten (Benten for short) is one of Japan’s most complex syncretic deities, having long ago been conflated and associated with other divinities from the Hindu, Buddhist, and Japanese pantheons. Her worship in Japan is widespread in esoteric Buddhist camps, Shintō circles, and Shugendō enclaves. Her many forms range from a two-armed beauty playing music to an eight-armed martial deity holding weapons to a monstrous three-headed snake to a divine representation of Amaterasu (the supreme Shintō sun goddess). Dragons and serpents are her messengers and avatars. Like Benzaiten, each creature is closely associated with water and the sacred wish-granting jewel. Today Benzaiten is one of Japan’s most popular deities. She continues to serve as the preeminent muse of Japanese artists, an unrivaled agricultural deity invoked for ample rain and bountiful harvests, and the sole female among Japan’s wealth-bringing Seven Gods of Good Fortune. Originally a Hindu river goddess named Sarasvatī, she was introduced to Japan (via China) in the mid-7th century CE as a multi-armed defender of Buddhism and the state. 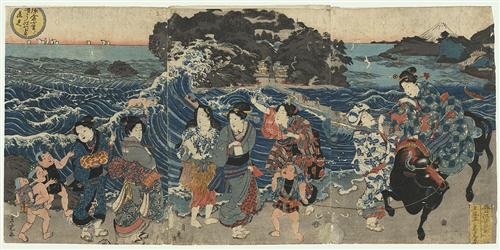 But in later times, she was “reconnected” with water and appropriated by Japan’s indigenous island cults and kami cults to become, essentially, a native “Shintōized” deity of wealth and good fortune. Until only recently, scholars of Japanese religions have generally ignored this phenomenon and instead focused on the “Buddhazation” of Japan’s myriad kami. In many ways, Benzaiten also exemplifies a unique form of “Japanese Hinduism,” making it more fruitful to explore her within a Deva-Buddha-Kami (Hindu-Buddhist-Shintō) matrix rather than within a binary Buddha-Kami (Honji Suijaku 本地垂迹) model. See Honji Suijaku popup note. This illustrated guide traces the evolution of Benzaiten iconography in Japanese artwork and explores her role as a beacon of Japan’s combinatory Deva-Buddha-Kami religious matrix. To a lesser degree, this article also examines the ritualistic context of her worship – how her art was employed in religious rites, state functions, Shintō ceremonies, and folk practices. A special side page presents presents mini case studies of Benzaiten’s main sanctuaries in both old and modern Japan. The Benzaiten page is presented in approximate chronological order and can be read as a whole or sectionally. To improve readability, information is sometimes repeated. It aims to augment the efforts of students, teachers, art historians, and scholars of Benzaiten lore and art by exploring iconographic dictionaries, sculptures, mandalas, paintings, talismans, and other religious art, both old and new. It draws from pre-modern and modern texts by monks, scholars, and art historians in Japan, Asian, Europe, and America. This handbook does not cover Benzaiten’s earlier evolution in India or China in great detail. For more on that topic, click here (popup note). ORIGIN & EVOLUTION. The Sanskrit term Sarasvatī refers to both a goddess and an ancient sacred river in India’s Vedic mythology. As the personification of this sacred river and of water in general, Sarasvatī came to represent everything that flows (e.g., music, poetry, writing, learning, eloquence, wisdom, performing arts). In the Rig Veda (a monumental Hindu text composed centuries before Buddhism’s emergence in India in the 5th century BCE), she is described as the best of goddesses, the “inciter of all pleasant songs, inspirer of all gracious thought.” In India, she was invoked in Vedic rites as the deity of music and poetry well before her introduction to China around the 4th century CE. She eventually entered Japan sometime in the 7th-8th century, where she was adopted into Japan’s Buddhist pantheon as an eight-armed weapon-wielding defender of the nation owing to her martial description in the Sutra of Golden Light. The oldest extant Japanese statue of Benzaiten is an eight-armed clay version dated to 754 CE (photos below). However, the formal introduction of Mikkyō 密教 (Esoteric Buddhism) to Japan in the early 9th century stressed instead her role as a goddess of music and portrayed her in the esoteric Taizōkai Mandala as a two-armed beauty playing a lute.